Cast: Matthew McConaughey, MacKenzie Foy, Michael Caine, Anne Hathaway, John Lithgow, David Gyasi, Wes Bentley, Bill Irwin, Josh Stewart. 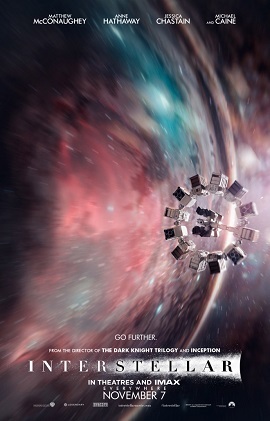 Christopher Nolan’s latest blockbuster, Interstellar, is an entertainingly ambitious, if flawed, sci-fi epic. It begins in a near-future where food supplies are dwindling, as a result of blighted crops. Presumably this is the result of global climate change, although this is not spelled out and, in fact, we never go beyond rural America to find out what is happening elsewhere in the world. The opening scenes are given a documentary feel thanks to the inclusion of some talking head segments from senior citizens reminiscing about the ‘dust bowl’ that they had lived through (these are actually clips of people describing 1930s Dust Bowl America). Matthew McConaughey plays Cooper, a widowed former engineer and NASA pilot who now reluctantly farms corn. His daughter, Murphy (MacKenzie Foy), is a chip off the old block but her brainiac tendencies don’t go down well at school, where the kids are taught that the Apollo moon landings were a hoax designed to prompt the Soviet Union into wasting money on rockets and other “useless machines”. Cooper is told that his children would be better off “learning about this planet, rather than reading fantasies about leaving it”. But when “Murph” becomes convinced that there is a ghost in her bedroom, Cooper’s investigations uncover a gravitational anomaly that is causing strange dust patterns on Murph’s bedroom floor. This discovery leads them ultimately to a top secret NASA base. Because the American public no longer have any appetite for exploring space, the agency is now operating in a clandestine fashion. Their Lazarus Project, headed by Professor Brand (Michael Caine), has been sending missions to planets beyond a wormhole in space. Cooper is recruited to lead another mission beyond the wormhole, together with Brand’s daughter Amelia (Anne Hathaway), physicist Romilly (David Gyasi), geographer Doyle (Wes Bentley), and robots TARS and CASE (voiced, respectively, by Bill Irwin and Josh Stewart). The wormhole appears to have been constructed by some alien intelligence, so Plan A is to return with the technology to save the Earth, but if this fails then Plan B is to recolonise a planet with the stored fertilised seeds from a variety of humans. However, Cooper is desperate to return from the mission because he wants to save his family. In addition, thanks to Einsteinian relativity Cooper’s children will age faster than him in his absence, therefore it is imperative for him that the mission goes as smoothly as possible (needless to say, it doesn’t). For much of the first half of Interstellar, I couldn’t help ponder with some amusement as to whether the film would enrage some of the more anti-science US Republicans. You know, the ones who deny the reality of man-made climate change, who think it is arrogant to believe that people could disrupt God’s work, and who think that the end-of-the-world will involve the faithful being transported to heaven in the “rapture”. Whatever its faults, Interstellar comes across as a resolutely pro-science film, asking us to think beyond our immediate concerns and to work for the good of our species. A scene where we learn that school textbooks have been revised to show that the moon landings were faked brings to mind those American school districts that have tried to remove or water down material on evolution. Whilst some of what passes for scientific explanation in Interstellar is Dr Who-style hokum, nonetheless in a wider sense it treats its audience as intelligent adults, particularly in the aspect of the storyline that relates to relativity. The second half, or perhaps final third, of the film is somewhat weaker as the ideas are gradually submerged beneath a swathe of frenetic action, except close to the schmaltzy ending where we get an outlandish explanation for certain events that occurred earlier on. The acting is serviceable, rather than outstanding, though this probably isn’t the kind of film that is likely to produce Oscar-worthy performances. However, even though a fair bit of suspension of disbelief is necessary, Interstellar is never less than entertaining.